Narrow lot homes are those that are built on blocks of land that are much thinner than a standard block but are still long enough to fit a full size home on. 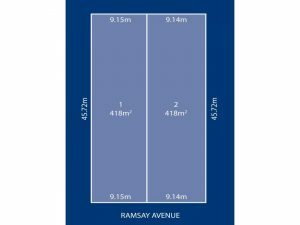 The picture below demonstrates two narrow lot blocks of land which are only 9.14 metres wide but 45.72 metres long, therefore giving the buyer a reasonable 418sqm of room to build. In times gone by a standard block would have been equivalent to both of these narrow lots put together, giving the owner an 18 metre frontage and a generous 800sqm of property. Since the demand for land is still strong in Perth and surrounding major towns, we have noticed more and more subdivision of large blocks occurring both by land developers and by landowners looking to make some money off their land investments. It is not unusual to find blocks as small as 200sqm in the current market and purchasers of narrow lots are forced to search house plans by lot size or narrow lot homes to find a home that will fit on their land. Alternatives are to consult a custom home builders mandurah and create a unique small house plan or speak with a narrow lot home specialist who will have a variety of narrow lot house plans to consider. The trick with these smaller blocks of land is to maximise the space available in your new home in clever ways and don’t forget there is always the option to build upwards when you can’t build outwards. Some space-saving ideas include reducing your backyard size to make your home more spacious, moving your garage to the rear of the home, making your garage a single instead of a double car space, moving your laundry into your garage, using void areas (such as underneath a staircase) to house storage space or to use as a computer nook and even having a loft built in to create an extra room. See how creative you can get! At Great Living Homes we have a selection of narrow lot options starting at just 7 metres of frontage, we also specialise in two storey home construction and we offer a custom design service to help you create the perfect design to suit all of your needs including block size. We boast over 20 years of experience in the building industry, we have knowledgeable, friendly and helpful staff, but above all of that we are passionate about building top quality homes and with many of our clients returning to us to build their 2nd or 3rd home, this demonstrates the level of confidence they have in our company.